Miyetti Allah yesterday said that their reason for slaughtering over 200 innocent and defenseless Christians in Jos yesterday was because they stole 300 of their cows. 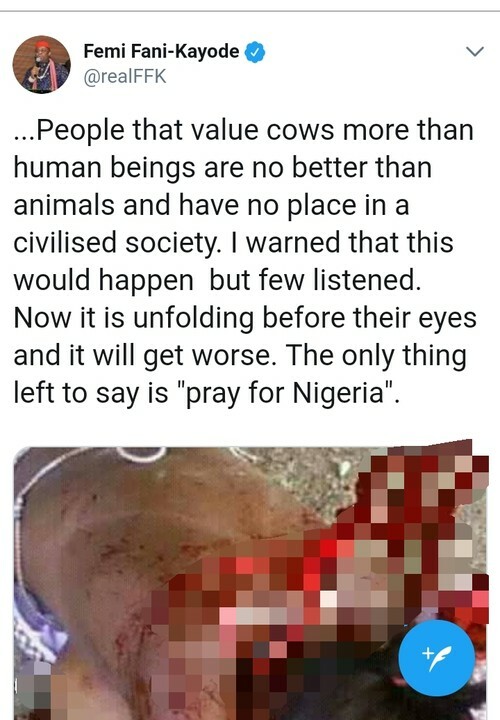 Femi Fani Kayode reacted by calling them barbarians and lamenting that he has constantly spoken against these creatures for the last three years. ..People that value cows more than human beings are no better than animals and have no place in a civilised society. I warned that this would happen but few listened. Now it is unfolding before their eyes and it will get worse. The only thing left to say is “pray for Nigeria”.